As perfect storm stories go, Airstream Innovations was at the right place at the right time as the Asian Citrus Psyllid and the disease it carries continues to threaten California’s citrus industry. It was truly forward-thinking nurserymen who chose Airstream’s greenhouses to ensure their crops could be exported anywhere in the world – USDA certified free of the dreaded HLB disease. With 400% increase in yields at half the labor cost and customer satisfaction resulting in longer term contracts, Airstream’s greenhouses have proven their mettle. In just the last five years, Airstream Innovations has become the world leader in wind-assisted, air-supported structures specifically designed for growing. With over one million square feet in operation they have conquered a corner in the California citrus nursery market with their pesticide and fungicide free greenhouses. But a storm of a different form has appeared on the horizon. It’s only logical with the widening state legalization of medical and recreational marijuana that Airstream is setting their sights on the burgeoning cannabis market. Like every other greenhouse company, the cannabis market is where to be. There’s also no question the agricultural lighting industry wouldn’t be where it is today if it wasn’t for cannabis. Water conditioning systems well known to the agricultural industry are just as mandatory for cannabis as they are for any food crop. Cannabis related soil, mineral, and fertilizer businesses are booming along with suppliers of HVAC systems, dehumidifiers, evaporative cooling and all the myriad processing solutions. It’s a good time to be in the supply side industry if you’re okay with cannabis. For the growers themselves, it’s a different story. The world of technology for indoor growing is as intricate and complex as the physics and process of life itself. What we’re witnessing is the migration of a clandestine indoor growing industry moving into the mainstream; an industry that is focused primarily on achieving the same results on a consistent basis. But for pot growers, being illegal has driven them into confined locations commonly referred to as “grandma’s basement”, or which I like to call “lemonade stands”. It’s precisely the 100% micro-controlling of the climate, under pressure from being discovered, is what drove the technology and created all these crazy-named strains like Gorilla Glue, Blue Dream, and Girl Scout Cookies. As a result, the mindset of a successful indoor pot grower has a difficult time with scaling operations to achieve their consistency goals. Like every good farmer I’ve ever met, they know what has worked in the past, but a pot farmer’s average growing area is a mere 3000 square feet. Few indoor growers have any real concept of scale. When they learn Airstream is offering quarter and half-acre turnkey solutions they can go numb. Whereas most farmers I know, that half-acre over there is where you park your truck! There is, of course, a fair share of outdoor cannabis growers but they are mostly located in optimal climates. With all this in mind, it’s disconcerting to learn that a high percentage of medical marijuana tests positive for pesticides and fungicides whether from indoor or outdoor suppliers. 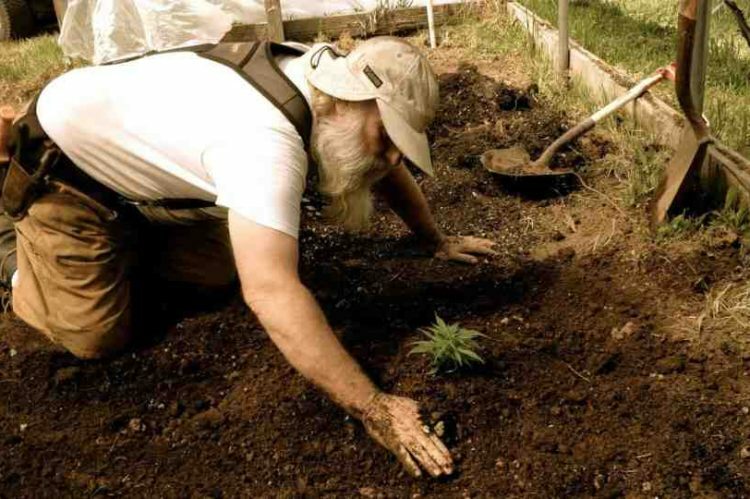 Due to the spider-mite, the bane of the industry, cannabis growers are relying on pesticides like Eagle 20 (myclobutanil) and other systemic poisons. Many believe they can “flush” out these substances but research has shown no amount of flushing can dislodge chemicals bound to the herb at a molecular level. One client reported they acquired what later tested out as ‘poisonous’ clones which required three generations of cloning to achieve clean test results. At 3.5 months per cycle, that’s nearly a full year of lost production. And when questioned at the 2016 Marijuana Business Conference, not a single grower admitted to using pesticides and fungicides. So, how do we account for the high percentage of negative results at the dispensary level? Either testing is lacking or growers have some explaining to do. Which brings up why Airstream is in this market. Their technology is founded on the principal of growing the cleanest crop possible through providing a production solution that meets or exceeds every criteria associated with “organic”. Not that their screened intakes can fully prevent a spider mite infestion, but the fact is they stop virtually any insect from ever reaching the plants by capturing and sending the airflow through thrip-resistant netting. This built-in protection and the optimized airflow makes Airstream’s greenhouses the very definition of super-organic and it’s achievable at a large scale. Capitalizing on their success in the citrus industry, Airstream is now challenging the conventional wisdom of how to grow clean consistent cannabis by offering affordable fully-automated, turnkey light deprivation solutions in configurations as small as 2000 square feet. This opens up Airstream’s proven technology to Tier 1 cannabis growers or entry-level organic produce businesses desiring to grow pesticide and fungicide free produce. Tier 2 licensees and higher will want to consider Airstream’s quarter and half-acre light-deprivation solutions which come installed less than $40 per square foot and offers optional fully automated lighting, fogging and heating. 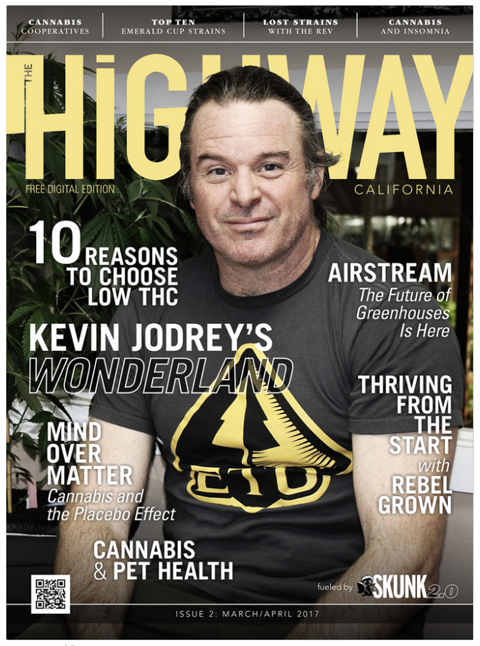 In terms of production, in one analysis, a 10,000 square foot Airstream growing area located along the CA central coast is capable of producing an annual 250 to 500 pounds of dried cannabis bud with an annual lighting cost of around $55,000 and a venting/heating/cooling cost of about $25,000. At the going rate of $1000 wholesale per pound (top shelf), return on investment is achieveable within 12 to 18 months. Not bad for a space where you used to park your truck. Component and facility maintenance is nominal and the life span of the translucent cover is five years which at current replacement cost is $30,000. These projections do not include growing costs such as irrigation, fertilzation, or labor and accounts for a relatively high DLI (daily light integral) of 40 moles of photosynthetic photos per square meter (40 mol/m2) to determine the need for supplemental light. To say the least, cannabis is a high value crop and profits are there to be made. The forward-thinkers are coming to Airstream with over 100,000 square feet of cannabis production facilities installed or in process. But as the wholesale price for cannabis continues to drop (as low as $1.67 per gram of top shelf in Washington state), the ability to make a profit is dependent upon providing the cleanest highest quality product at the lowest cost on a consistent basis which is what Airstream’s technology is all about. For the boutique cannabis growers trying to keep their nose above water as the wholesale prices fall ($500 per pound is already here! ), they will hopefully find Airstream or sadly go out of business. SAN DIEGO, CA. The term “pressure” has been tossed around a lot in the farming industry and one thing is clear. We all agree pressure is bad. At worst, it is a disaster, at best, a distraction. But not in this case. There’s a fresh positive attraction to pressure when it comes to David Chelf and his amazing positive pressure greenhouses. We caught up with David last October in San Diego for an interview. Within 20 minutes we knew we had to share this story about a revolutionary physicist-turned-farmer with patents in 13 countries and a very busy schedule. For you venture capitalists out there, take note of Airstream Innovations, Inc. Imagine a translucent tent the size of a football field held up by nothing but air. The enormous cover is firmly attached at the base by a heavy-duty sleeve buried into the ground. At one end are two 20 foot cylindrical intake towers protruding through the roof. At the other end is a roll-up door big enough to drive a tractor through. Outside, the towers are wrapped in pleated skirts that act as 360 degree checkvalves forcing the prevailing wind inside. At the juncture of the intake tower and the cover are adjustable-speed fans that keep the structure continually inflated. Inside, at the base of the intake towers, a high-quality net prevents pests from entering. The environment is fully automated through a programmable control box that calibrates the wind and fan speed to stabilize the tunnel while a network of cables are secured criss-cross fashion over the entire structure to equalize the air pressure on the cover. Chelf seems to have thought of everything including dedicated generators, a battery backup system, and an early storm-warning system to protect staff and the crop in case of an emergency. Airstream has rated their greenhouses to withstand winds up to 80 miles an hour. Chelf admits he did not invent ventilation or air supported structures. What is ground-breaking is his ability to increase productivity by precisely controlling the airflow to optimize growth conditions. Airstream greenhouses can be programmed to deliver the perfect ventilation scientifically calculated for optimal transpiration and crop mineralization for virtually any crop. 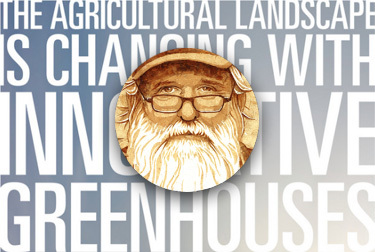 The result is an astounding 30% more growth than conventional greenhouses. Chelf has been developing his technology over 10 years. A former UCLA PhD candidate in physics, Chelf left the program to do what he loves: grow healthy, high-quality and exceptionally tasty food. He became expert in commercially growing mâche, an edible green, for Trader Joes and soon became convinced a controlled environment was what was needed. Like a modern-day Edison, Chelf refined his greenhouse production system, dialing in every aspect imaginable. His first tunnels were for his own label growing mara de bois strawberries and heirloom tomatoes for high-end restaurants. Three years ago, through word-of-mouth, the citrus nurserymen came calling and after several successful commercial installs, Chelf decided to focus all his efforts on selling his greenhouses. And selling they are. Airstream Innovations has found great demand within California’s citrus nursery production. 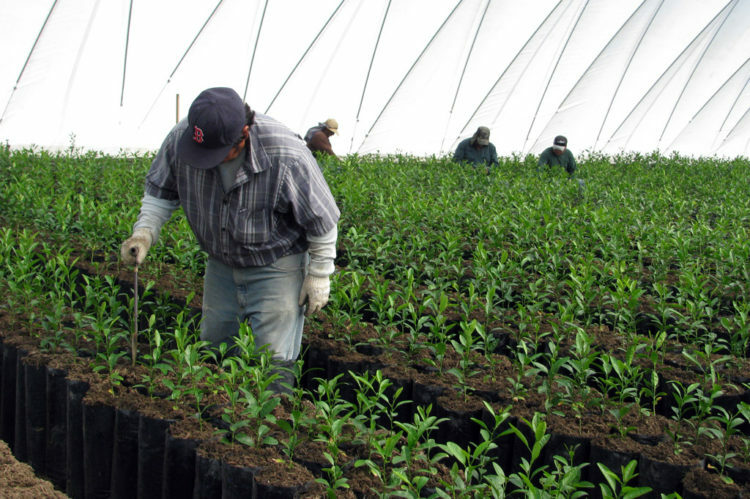 The USDA and CDFA are regulating California citrus nurseries due to the presence of a flying insect, the Asian Citrus Psyllid (ACP), and the disease they may carry, Huanglongbing (HLB). 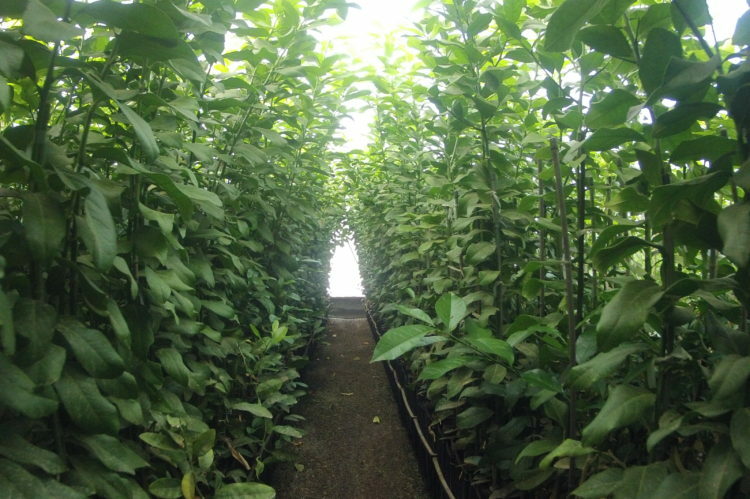 Because of their insect netted intakes and the high positive pressure throughout, Airstream greenhouses easily meet the requirements of the USDA for insect protected production of citrus seedlings. Because these are not rigid structures, adopters are saving as much as one-half to two-thirds the expense of a conventional half-acre greenhouse. Installation takes five workers two weeks to trench, erect the towers and attach the cover. Then in just a few short minutes, your greenhouse is inflated to full capacity and workers and equipment can immediately move in. The low cost of entry, optimized growing conditions, water efficiency, and the elimination of pesticides, leads to a rapid return on investment in as little as one year. A less-apparent benefit is that Airstream’s structures are considered temporary so property taxes may not apply. This is a significant benefit to property owners looking to make their land productive but avoid the permits and costs associated with a rigid, permanent structure. To date, Airstream has delivered 18 units with four more scheduled for installation. They estimate a million square feet will be in full production before year end. As we ended our interview we learned citrus nurseries are in dire need of an affordable controlled environment and Airstream Innovations’ greenhouses appear to be the best thing going. We also learned smaller organic growers can obtain a huge market advantage of a pesticide-free half-acre for as little as $125,000. But that was not all. 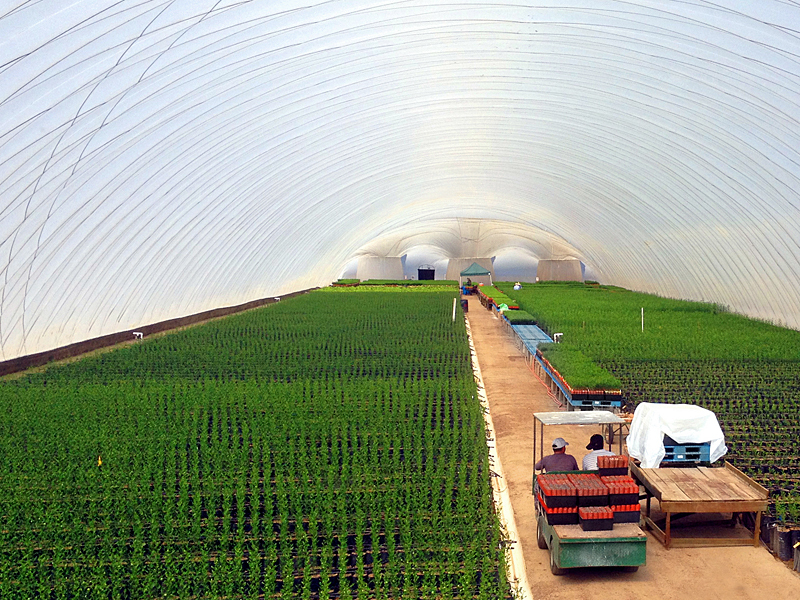 In the following months since then, we visited their three tunnels at Brokaw Nursery in Ventura County. It was beautiful inside, almost ante deluvian. But what really hit us was just how big these structures really are. Now, we imagine other uses like indoor winter parks, housing for animals, fish farming, organic herb farms, year-round polo and soccer fields, concerts, weddings and more. As there appears no limit to the possibilities, this is a company worth keeping an eye on.